Are you looking for one more reason to move away? It sounds like if/when the Big One starts shaking, you will need to grab everything you own and move to Yuma. The Nuclear Regulatory Commission (NRC) admits in their November 28, 2018 NRC Inspection Report and Notice of Violation, every Holtec canister downloaded into the storage holes is damaged due to inadequate clearance between the canister and the divider shell in the storage hole (vault). The NRC states canister walls are already “worn”. This results in cracks. Once cracks start, they continue to grow through the wall. The current storage system puts the public at risk. Nuclear waste stored in thin-wall steel canisters (only 5/8? thick) cannot be inspected, repaired or safely transported. Thin-wall canisters crack, but technology does not exist to inspect for cracks or repair cracks once canisters are filled with highly radioactive nuclear fuel waste. San Onofre will have 73 canisters stored on-site by mid 2019. Wow! You’re a stand up guy for sharing this information in your sales area. And I’m looking to move back to that area… Pretty much anywhere between San Diego and Huntington Beach. Sigh. I’d shrug it off as fake news if I didn’t read every link. The lack of oversight by regulators is shocking. The workers make a mistake and drop a canister into the hole without positioning it correctly, and the NRC hasn’t gotten around to a reprimand yet, let alone corrective action? And they let them continue to load more canisters in place? 10 CFR 72.172 requires, in part, that, licensees establish measures to ensure that conditions adverse to quality, such as failures, malfunctions, deficiencies, and deviations, are promptly identified and corrected. Contrary to the above, from January 30 to August 3, 2018, the licensee failed to establish measures to ensure that conditions adverse to quality, such as failures, malfunctions, deficiencies, and deviations, were promptly identified and corrected. 1. On July 22, 2018, the loading crew experienced difficulty in aligning canister 28 for downloading into the independent spent fuel installation vault. However, the licensee failed to enter this deviation in downloading conditions into its corrective action program to determine the cause of the misalignment problem and develop corrective actions to preclude reoccurrence. 2. From January 30 to August 3, 2018, during canister downloading, contact between the canister and vault components frequently occurred. However, the licensee failed to enter instances of contact into its corrective action program and perform an assessment to disposition the exterior conditions of the downloaded canisters and vault components. This is a Severity Level IV violation (NRC Enforcement Policy Section 6.3). I like the move though. The more public exposure this gets the more likely there will be positive progress with the issue. It’s the right thing to do. Watch the youtube below of the president of the company talking about cracks in the canisters. He says they are highly unlikely, but if they do happen there isn’t anything they can do. They will have to wing it. I agree, and not only can we handle the truth, but if somebody happens to read this who knows somebody in charge, maybe we can effect change. I’m going to say something! 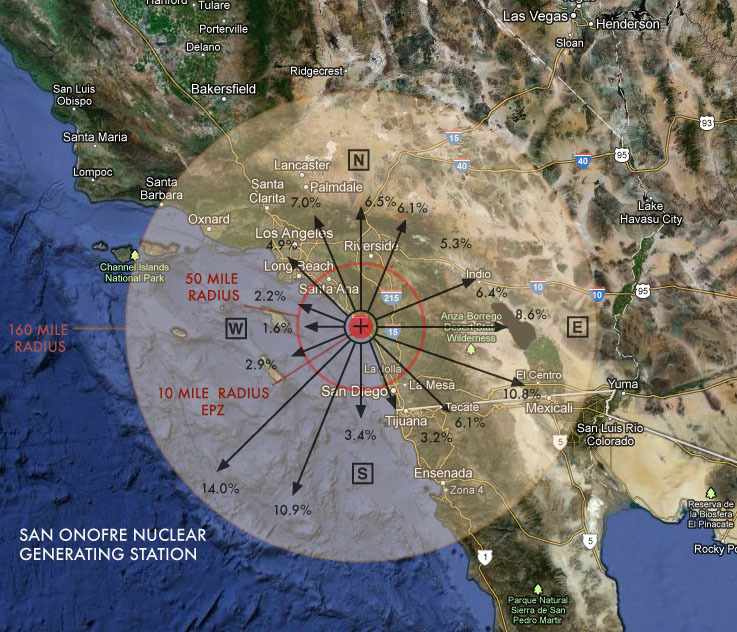 I don’t have to get into the decades of disputes about where to store nuclear waste, and how it led to the decision to just leave the junk at San Onofre, but it is insane that it is allowed to happen right in the middle of 10 million people who live on an earthquake fault. We are not alone. Chilling. That liability stems from the Nuclear Waste Policy Act of 1982, which said the federal government would take responsibility for disposing of the waste in a nuclear repository. A 1987 update to that law dedicated the controversial Yucca Mountain site in Nevada as the location for that facility, despite protests from state and local officials in Nevada. but if somebody happens to read this who knows somebody in charge, maybe we can effect change. BTW, I think the Fed reads the blog, and my request is for them to not raise their rate at the December meeting so we can avert plunging real estate sales in early 2019. 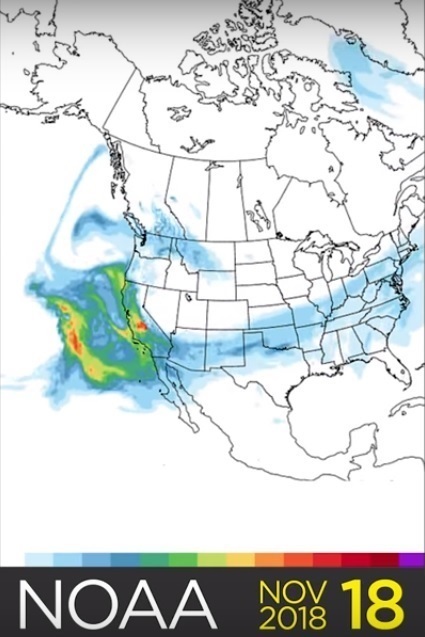 Looking at the NOAA map, there’s a lot of “red” states that will also be impacted by what “could” happen at San Onofre. Those Congress People/Senators that think this is only a California problem, better think again! Wait until those states realize what could come at them through those winds!